Part 107 Drone Pilot Test Prep Ace your Part 107 exam with our online Test Prep course to become a FAA certified commercial drone pilot. Pass the drone pilot license exam with flying colors. with little-to-no drone experience, this is serious Part 107 preparation—made easy! Fun and easy to understand, yet comprehensive. Relentlessly precise and up-to-date with the FAA, this course delivers solid exam preparation you can rely on. Seamless, hi-def multi-media content make lessons convenient and enjoyable across devices—any time, anywhere. Freedom to study at your own pace, with six months of unlimited, on-demand access. If you have any questions about Part 107 Drone Pilot Test Prep, please ask us. Our reps are standing by to help. Developed by our elite team of drone experts. The FAA’s commercial drone exam can be intimidating for beginners with no prior aviation experience. Our curriculum development team brings decades of UAV and manned aircraft experience to the table. You get thorough, up-to-date exam preparation you can rely on in a fun, easy-to-do format. Get ready to ace your Part 107 exam today. Sign up now to activate your online account and gain instant access to all of our Part 107 lessons, videos, study guides, and more for 6 months. We look forward to getting you launched and training as a Certified UAS Pilot. Took the online course offered by DARTdrones to prepare for the Part 107 Exam. Went in today and finished the test in just over an hour. Extremely happy to announce that I PASSED with an 85% score! This course helped me tremendously. Thank you, DARTdrones. I just passed the Part 107 test! Thanks to DARTdrones for the courses, materials, and email follow-ups to my questions! Nobody could possibly succeed at this test on their own. DARTdrones did an incredible job in getting me prepped for the test. I received an 85% and passed!! The online test prep was very useful. I would recommend the DARTdrones online Part 107 Test Prep Course to anyone who is looking to pass their UAG. Thanks to the help from Abby and her gang, I passed my Part 107 exam a week after taking their online course. I can’t thank them enough. I continue to recommend DARTdrones to all my customers. In August of 2016, the FAA launched new rules for commercial drone pilots under the FAA regulations called Part 107. The new rules allow people interested in flying their drones for a profit or commercial use to gain a license from the FAA to fly their drone for commercial purposes after passing a 60 question, 2 hour exam offered at an FAA testing center. (The old rules used to require a 333 exemption and a manned aircraft pilot’s license. This is no longer necessary.) Someone new to aviation could commit 15 – 20 hours of study time and be ready to pass their exam. The cost to take the exam is $150, paid to the testing center. 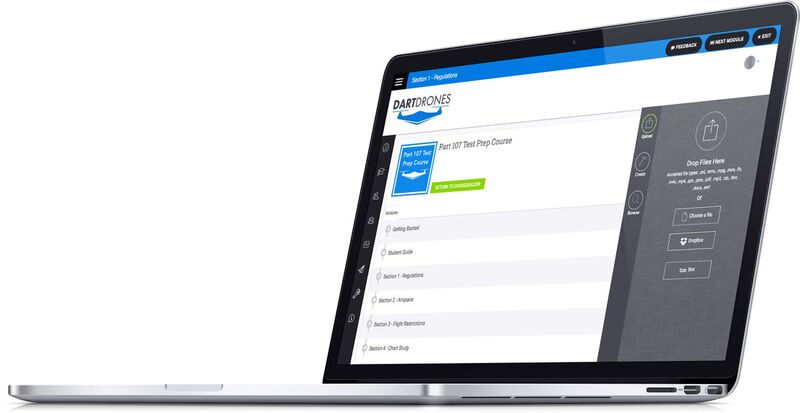 DARTdrones does not offer locations to take the exam, but it’s really easy to book it at one of the FAA’s 690 testing centers across the country. Once you pass the exam, you get your certificate within a few weeks and are able to fly commercially. Drone pilots have access to our course for six months. The course is completed at your own pace, but you can expect to commit 8 – 15 hours before feeling ready to take your exam. The 300-plus practice test questions can take several hours to complete. DARTdrones is the national leader in drone training. This course was developed by a leading curriculum developer in the drone industry with input from our over 40 Flight Instructors. The course includes extensive video-based training curriculum, a 45-plus page student guide, over 300 practice test questions, advanced learning management technology, and access to our Chief Pilot for any questions.